Adulthood can feel lacking in terms of fresh starts. Once you’ve completed any schooling and start off in the working world, a chance to truly start over is rare. Projects stretch on for years, another deadline is always looming, and the only part of January that feels “fresh” is writing out a new date. But even if you’re not handed that “first day of school” feeling every year, it can be important to create it yourself to get out of a rut – especially in terms of your finances. Here are some great exercises you can commit to at the beginning of each year to refresh your accounts and keep your finances in check all year long. 1.) Assess your debt and make a plan – No matter where you are in your financial journey, this is the best place to start year after year. If you come back to your debts each and every year, it will help you set a plan and set the tone for your year. Considering 80 percent of Americans are in debt, this is one area that most of us need to focus on. 2.) Boost emergency savings – America has a serious saving problem. More than 60% of Americans have less than $1,000 in savings, and of that number, about 28% have no savings at all. Even if you’re not in that camp, it’s still important to take time every year to assess your own situation. How much do you have in savings, what would you need in case of an emergency, and how much in your emergency fund would put you at ease? Covering those bases right from the beginning allows you to focus on more long-term saving. 3.) Review retirement savings plan – If you haven’t checked your 401(k) plan through your employer, now is the time to assess where you’re at. See what percentage of your income you’re setting aside, and consider increasing it if you received a raise. Even if you aren’t making much more than you were last year, it’s always important to make sure you’re contributing as much as you can to your plan. If you are self-employed or your job doesn’t offer a 401(k) plan, look into opening a Roth or traditional IRA. Even upping your contribution by 1/2 – 1% will make a big difference in the long run. Whatever you choose, make sure you’ve set yourself up to contribute to your retirement savings at a rate you’re comfortable with. 4.) Check up on insurance policies – If you started this year with a new insurance policy, familiarize yourself with it as much as possible. If you’re shopping around for new insurance, take the time to see what you’re currently receiving, where you can cut costs, and where you need to beef up your coverage. Take an active role in reviewing all of your policies and making sure everything is still working for you. You want to be sure you are getting your money’s worth. Also be sure to check insurance policies for beneficiary information. That includes contingent beneficiaries – especially if you have children. When major life changes happen, people often forget to update their policies to reflect those changes. 5.) Update your will and plan for the future – Whether you’re in your thirties, fifties or eighties, it’s time to set up a will. This is especially true if you have children or will be having children soon. This gives you the chance to sit down and designate who will inherit your property, take custody of your children and even receive the passwords to your online accounts. Review your will annually or as needed to make sure it remains up-to-date. Additionally, if you got married last year or went through some other major life event, be sure to update your beneficiaries as soon as possible. 6.) Give yourself short term goals every week – Here’s the downside to New Year’s Resolutions: They’re often too broad, too much or too soon. Most people set lofty goals for themselves, and they’re doomed to fail from the start. Instead, give yourself a few big-picture goals for the year, (pay off debt, increase savings, boost retirement fund) and find small tasks each week that contribute to one of your goals. This is an exercise that keeps finances a priority, and instead of getting down on yourself about your current situation, it forces you to take consistent action to address the problem. 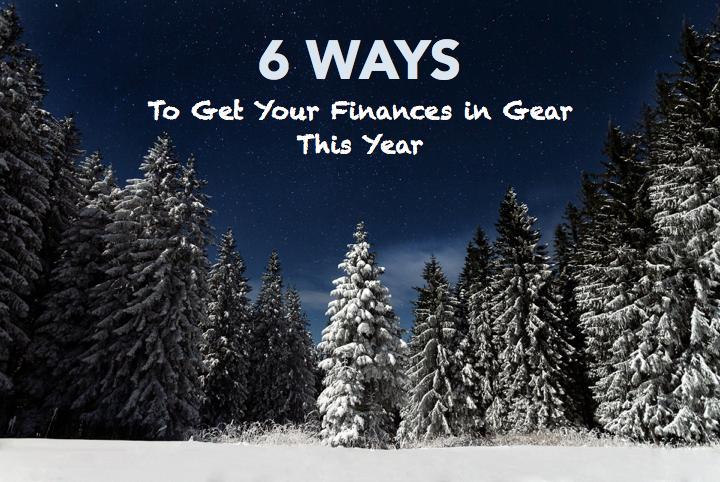 Whether you’re preparing for your taxes, setting aside a little extra for savings or chipping away at your debt, staying on top of your goals is the best way to make a real impact in your financial house in 2016.